Nestled in the centre of the beautiful village of Lustleigh, this holiday let is a quintessential 16th century thatched cottage full of character and charm – sensitively restored and packed with original features such as inglenook fireplace with wood-burner, beams throughout plus an original granite staircase. 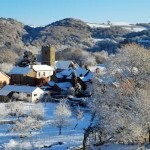 English country cottages rarely come prettier than this self catering holiday let. With 3 bedrooms and 2 bathrooms, sleeping up to 5 guests comfortably, this holiday let is perfect for families and friends looking to explore Dartmoor and the beautiful beaches that this part of Devon is famous for. 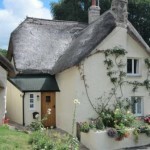 As holiday lettings go this country cottage has it all! This cosy yet spacious holiday cottage is also ideal for a couple seeking a romantic escape, encompassing long walks on Dartmoor and evenings spent relaxing in front of the fire.